17.5" x 12.5" x 3"
11.5" x 12" x 12"
7.5" x 20" x 20.5"
19.75" x 11" x 5.75"
Greetings! I am excited to share lots of new and exciting work with you this month. After 33 years in the glass art business, I am often still amazed at the talent, creativity and versatility of the artists I represent. Of course there have been huge changes over that period of time but it is also interesting to track the incremental changes happening continually in the way that artists work with the glass medium. Enjoy the images, visit the artists’ web pages to see more and, as always, feel free to contact me with your comments and questions. I love everything about this new cast piece by Alex. The simple lines, the dramatic green center in the field of soothing amber, the surface work. Alex’s work continues to surprise and delight. This is one of my all time favorites of Nancy’s "Top" series. The inclusion of Murini (glass beads) adds a dynamic element to this familiar form and the colors are stunning. By the way, on Monday Nancy gave a TED talk in New York. I hope to have a link to that talk to give you in my June E-newsletter. This new piece by John, just finished in the last few days, is both ultra simple and very sophisticated. The lines are so pleasing and the colors perfectly harmonious. I am offering two images of this piece and, like many glass sculptures, it could be equally as appealing seen from any number of angles. Here is another of Stephen’s new series of smaller works. 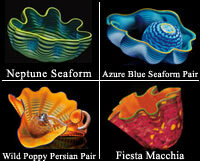 In this case he has opened up the vessel to create more of an abstract bowl shape. I like the asymmetry of this piece and the colors are spectacular. The response to the new smaller format has been very positive, particularly from collectors who love Stephen’s esthetic but lack space in their homes for his larger works. I have just received my new spring/summer Lino inventory! Please visit Lino’s web page to view the other great works created by the Maestro. You will see outstanding examples of familiar series "(Dinosaur," "Mandara," "Angel Tear") and also some series you may not be familiar with, such as the "Kira" pictured here. Please contact me for further information or for a link to the available works from Lino’s current retrospective exhibition in Venice (catalog available: email [email protected]). There has been so much interest in the new Studio Editions by Chihuly that I decided to include them again in this month’s issue. It is wonderful how these smaller pieces by Dale capture the same sculptural sophistication and intensity of color as his larger scale works. Thank you for your time and interest and stay in touch! !